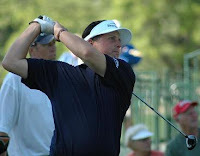 After Phil Mickelson appeared to have won his s econd consecutive tournament in 2007, Lefty fell again on the last hole to tie with Charles Howell III after 72 holes. Charles Howell III made par in the group in front of Lefty, but Lefty sliced his drive after the group had putted out. Phil put his approach shot in the rough and hit a poor pitch onto the green. A close miss left Lefty in a playoff with CH3. Phil had said he felt in control of his game and came out as a better player due to the Winged Foot blowup. Unfortunately for Phil, he resembled Greg Norman coming down the stretch at Riviera Country Club. On the third hole of playoff, both players' tee shots came up short on Riviera's par three. Lefty came up short of the hole after his putting from off the green. Charles Howell III then managed to stick his chip shot very close to the hole, and made the three footer for par while Phil missed. Charles Howell III picked up his second career victory, his first since 2002. Howell, who works with David Leadbetter, won on the PGA Tour at 22, but has yet to win since. He came up close several times this year, and finally came through in the clutch. On the second hole of playoff, Howell put his drive on a cartpath. With trees on both sides, he was stymied into hitting off the concrete. His 8 iron clipped the trees and fell short, but he knocked his pitch shot very close to the hole. Howell takes home a $936,000 paycheck and is now the leader in FedEx Cup points. Mickelson is second in FedEx Cup points. Howell has played in 195 events in his career and this was only his second career win. He has also finished in second place ten different times without pulling through. Rich Beem, who had won a car on Saturday with a hole in one, had a tough final round and finished the day in 13th place. Padraig Harrington had his worst game of the week and shot a 73.Three players finished the day tied for third place: Ernie Els, Robert Allenby and Jim Furyk. Phil appeared to be in control for most of Sunday after keeping a 3 stroke lead on the rest of the field for several holes. Rookie Anthony Kim made a run into the top of the leaderboard after firing a 7 under par final round, but never posed a threat to the leaders. 0 Response to "Charles Howell III beats Lefty in playoff en route to second win"